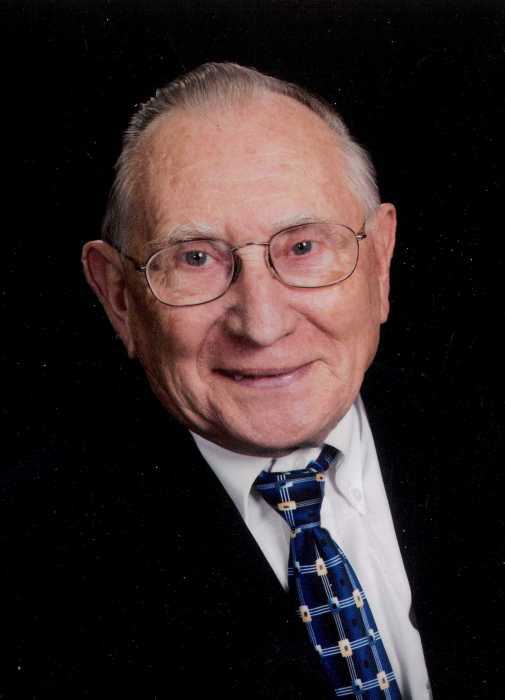 Ivan Dale Schmid, longtime resident of McCook, NE, entered into eternal rest on January 14, 2019 after a short stay at Hillcrest Nursing Home in McCook. He was 90 years old. Ivan was born August 30, 1928 to parents Elmer and Lena (Fickenscher) Schmid at Curtis, NE. He was one of four siblings who grew up in Curtis. Around the age of twelve, Ivan’s family moved to McCook. He and his siblings began attending school in McCook where Ivan eventually graduated with the Class of 1948. Following high school, Ivan proudly served his country in the United States Army. Ivan served during the Korean War, from 1950 – 1952, before his honorable discharge. Ivan married the love of his life, Pat (Rogers) Schmid on September 11, 1955 in McCook. To this union three children were born; Deborah, Donald and Cathy. The family made their home in McCook. Many knew Ivan as Mr. McCook because of his volunteerism and willingness to lend a helping hand in the community. Together with Pat, Ivan owned Ivanhoe’s Donut Shop from 1974 to 1996 when the couple retired. Ivan looked forward to helping with the McCook Humane Society Garage Sale each year. Over the years, Ivan received several community oriented awards which include the Chamber of Commerce Community Builder Award, induction into the Bison Alumni Wall of Fame, and he and Pat were also the Heritage Day’s Honor Family in 2005. Ivan never knew a stranger and was liked and respected by all who came to know him. Ivan and Pat were members of the Memorial United Methodist Church in McCook where Ivan served as an usher and also worked with the youth group. Ivan was preceded in death by his parents; sister, Iona Dunn; brother in law, Jack Rogers; and sister in law, June Schmid. Those left to celebrate his life include his wife of 63 years, Pat Schmid of the home in McCook; two daughters, Deborah (Keith) Weber of Graham, WA and Cathy Schmid of Lincoln, NE; son, Donald Schmid of Chadron, NE; brother Wayne Schmid; sister, Rowena Padgett; brother in law, Rodney Rogers; six grandchildren, five great grandchildren and three great great grandchildren; as well as numerous nieces, nephews, cousins and a host of friends.